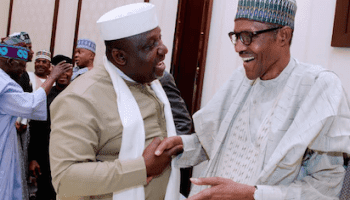 Imo state governor, Rochas Okorocha, has appealed to President Buhari to use his “magic hand” to make APC Anambra governorship candidate, Tony Nwoye, win this Saturday, November 18th election. Okorocha made the appeal at the grand finale of the APC Anambra state governorship election campaign in Awka, Anambra state yesterday November 15th. “Kogi is a young man, you made it possible for him. Kebbi is a young man, Niger is a young man, Edo is a young man, Katsina is our elder brother. The way you brought these people, use that same hand of blessing, the magic hand of Buhari to give us Tony Nwoye. I sat down to search out who you are and to define you but I can’t. The way you turned around the economy of Nigeria, brought us out of recession, use the same magic to give us Nwoye. It’s the same manner you went to the hospital and everybody thought you were gone, you came back strong even stronger than before, looking more handsome; give us Tony Nwoye. My president my president, we look up to that day on Saturday when we can come back and raise the hand of this young man. Then you’ll see the south-east, the Orji Uzo Kalu, the Nwobodos, the Ken Nnamanis and your ministers, you have people. The only one you should try and check for us, to try and see if you can add something to his height is Ngige because, with this height, we have a challenge.” he said.